In today’s Siteturner theme round-up, we’re looking at the best YouTube style themes for WordPress currently available in 2019. If the Vimeo/DailyMotion/YouTube style isn’t quite what you’re looking for in a video theme for WordPress, and instead prefer a magazine-style layout and design (that’s more appropriate for vlogs), you might want to check out the companion to this article, 10+ Best WordPress Video Magazine Themes. On the surface, the must-haves for a YouTube or Vimeo style video sharing theme appear to be self-evident. You need to be able to add and stream videos. Pretty straight-forward, right? But there are some more things to consider, because after all, WordPress itself supports embedded video out-of-the-box. One feature you’ll absolutely want to have is the ability to upload and self-host videos. You won’t be able to brand the site and establish yourself as an independent sharing site otherwise. You may also want to consider the layout and general appearance of the theme. If you do want to build a YouTube inspired site, it’s best not to choose a look that will confuse your visitors. Some of the video themes out there are designed in a ‘magazine’ style, and might not quite fit the bill. We yanked all these themes out of the ether by hand, using our good sense and taste. Most support self-hosted videos, but we make note of it when they do not. It’s also worth noting that all of the video gallery themes on this list are premium products. To be frank, you’ll be hard-pressed WordPress theme like YouTube or Vimeo for free, and most of these are very fairly priced. 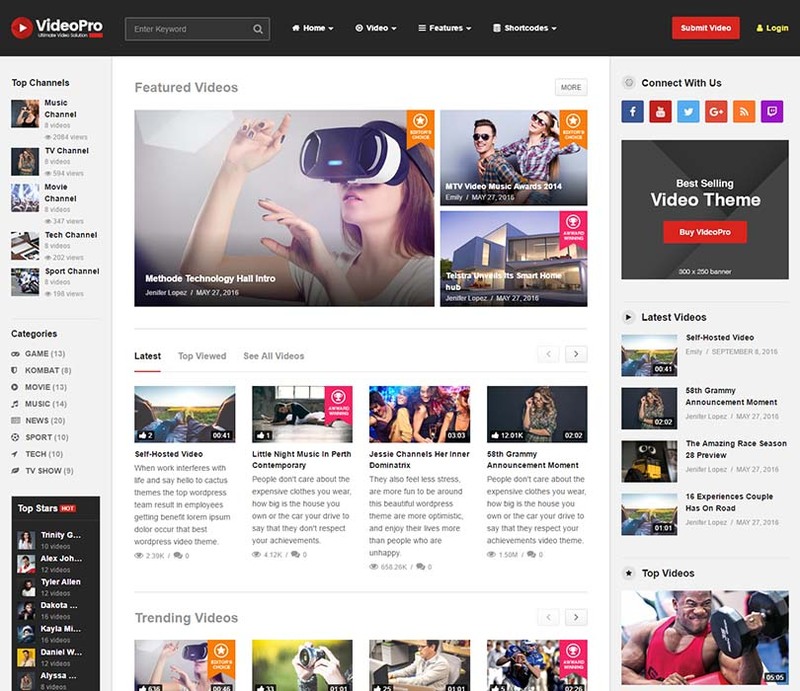 Currently, the WordPress video sharing theme to beat is VideoPro, available exclusively on the ThemeForest marketplace. It comes with all the features you need to build a robust video community similar to that YouTube and Vimeo. The new 2.0 version even integrates membership features and functionality that will allow you to sell premium content. Users can submit their videos viathe front-end, and VideoPro supports a variety of video networks including Dailymotion, Facebook, Twitch and, of course, YouTube and Vimeo. 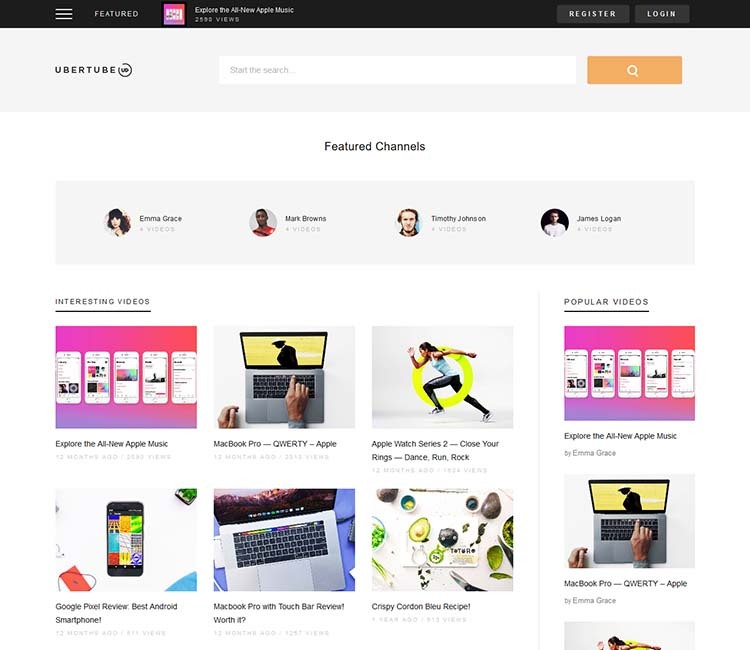 Users can set up their own video channel, build their own web series, and create and manage playlists. Even live video is supported. Cool usability features like the floating video player (that follows you as you scroll) add to the user experience. A variety of layouts and options ensure flexibility. The developers also provided predefined advertising spaces to help you with monetizing your site. Highly recommended, and definitely worth a closer look. Ubertube is a user-friendly, modern theme that’ll help you build a YouTube-like site quickly and easily. It includes all the core functionality necessary for a streaming video tube website, like front-end video submission, playlists, subscriptions, user notifications, and likes & dislikes. The user back-end allows for video editing, profile customization, and more. The design is fresh and modern, and the performance is snappy. Visual Composer is supported, for creating and management layouts. Overall a top-notch video theme that deserves more attention. The clean, modern design, and the snappy, intuitive UX are partly what make our next selection, Video Café, standout. This minimalistic theme takes a less-is-more approach and includes everything you need to build a simple video sharing site and nothing more. Users can easily upload videos from the front-end or link to videos from other popular sharing sites. Video café is easy to customize and manage, featuring integration with the ubiquitous Visual Composer (for drag & drop page building) and a comprehensive admin/options panel built with the Redux framework. MailChimp is also supported, to help you build your mailing list. A straightforward and expertly assembled solution for those who only require basic video sharing functionality. 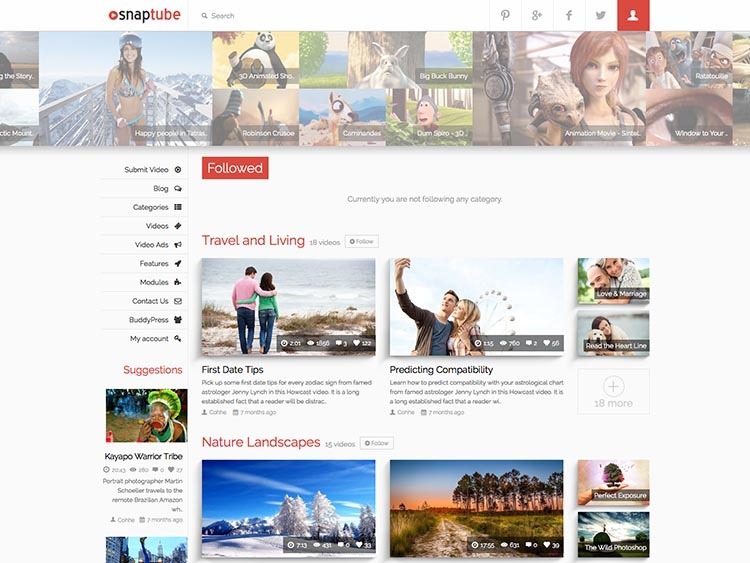 Next spot goes to SnapTube, a fairly new video sharing theme by Cohhe on ThemeForest. Part of the reason we favored this theme is its unique design: it eschews premium theme cliches in favor of a look that’s clean, modern and user-friendly but doesn’t seem like a rip-off of anything in particular. SnapTube allows you to embed or upload your own videos. It’s also a flexible theme, with a lot of options for customization on the backend, and a drag & drop frontend page builder gives you full control over the layout. Special attention has been paid to advertising, too, so the site can easily be monetized. It’s retina ready, responsive, and it’s bundled with a nice selection of custom widgets and modules. Detailed documentation is provided, so you won’t get lost, and solid user reviews indicate high usability and an above average support team. Highly recommended. Slimvideo was designed & developed for building robust, video-sharing websites and communities like YouTube and Vimeo. The theme is sleek and modern, embracing a minimalistic aesthetic and flat design trends without sacrificing style and character. 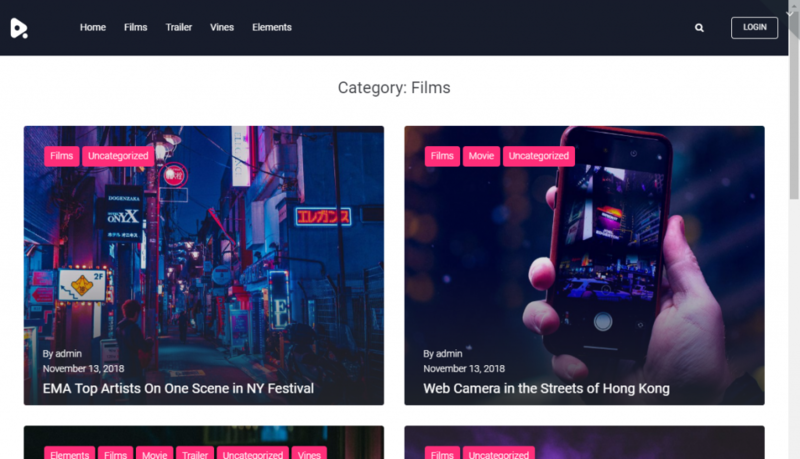 The essential functionality is here, including support for the front-end submission of videos, images, and content, ensuring a fun & intuitive user experience. A selection of strong secondary features, like drag & drop page building and mega menu support, adds even more value. Slimvideo is retina-ready, guaranteeing a crisp display on the latest high-res devices, and it’s 100% mobile-ready for a flawless user experience across the full range of smartphones and tablets. Tons of options are built-in for tweaking and customizing the theme elements. Several useful custom widgets are bundled, and everything is translation-ready out of the box. The restrained, airy design of Videofly might have been its strongest feature if not for its remarkable feature set and user-friendly UI. Front-end submissions are nicely integrated & intuitive, and Videofly supports three types of video sources (embed, URLs, uploads) and the leading video sharing sites. You can even use the provided YouTube importer. The attention the developers have given to ad integration is another notable feature. Many theme designers have a tendency to overlook monetization. That’s not the case here, and Videofly fully supports pre-roll ads, image-over ads, and text-over ads. Other useful extras include a mega menu, custom widgets, sticky sidebars, and infinite/lazy loading. The UX is finely tuned, and performance/speed is excellent, scoring a 96/100 via Pingdom tools. Videofly is retina-ready, fully responsive, and well documented. OneVideo brings so much good stuff to the table, that we couldn’t possibly cover it all in a blog post blurb. Touchsize, the team behind OneVideo, aren’t new to creating high-quality video sharing themes for WordPress. Some of the highlights include front-end submission, increasing essential to providing a good user-experience to your visitors, and trending monitors to track the popularity of user uploaded videos. Notably, OneVideo’s strongest feature might be the attention its creators have paid to advertising: some WordPress developers have a way of overlooking this entirely, despite the fact that most webmasters aren’t hobbiests but entrepreneurs looking to monetize their sites. The also theme includes plenty of options on the back-end, for codeless tweaking of fonts, colors, and more, and its well documented and supported. Again, there’s far more packed into this theme than we can cover here–we recommend having a closer look at the product details and demo (which includes access to the back-end). Highly recommended. VideoTouch is a brand-new, ultra-flexible video sharing theme that’s retina-ready and optimized for use on mobile devices. The theme particularly excels on touch-screen devices, as implied by the name. Infinite color schemes and layouts are made possible thanks to an advanced options panel and a touch-screen, drag and drop page builder. VideoTouch is optimized for user experience (UX) and allows for frontend submission of videos. A Mega Menu is built-in, and WooCommerce is supported. 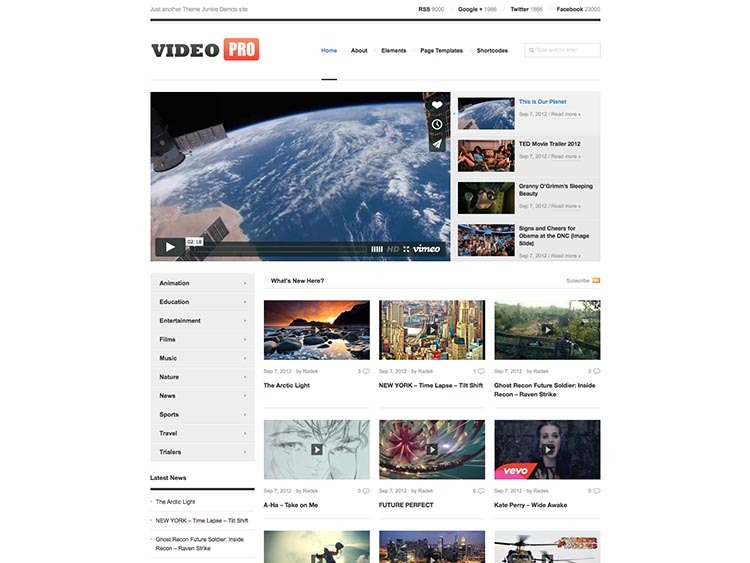 Our next selection, VideoTube, is another video theme from ThemeForest. Clean, flat and modern design make this one a standout. The straight-forward design make it fast and easy to use, which your visitors will no doubt appreciate. 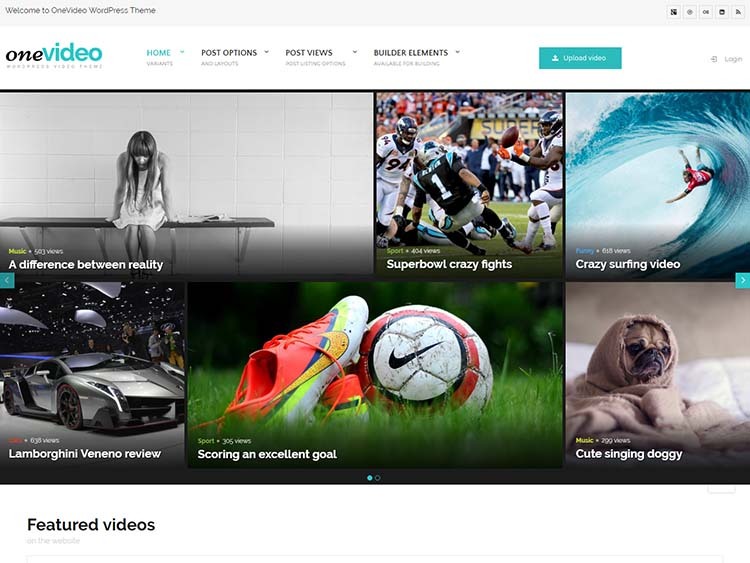 With VideoTube, you have the option to host your own videos, or embed from third parties. Users can also submit their own videos, and run their own channel, similar to the way YouTube, Vimeo, and other sharing services work. There’s six different color schemes included, and users can make additional modifications using the advanced theme options. The popular Visual Composer page building plugin is bundled in, too, making layout changes a snap. 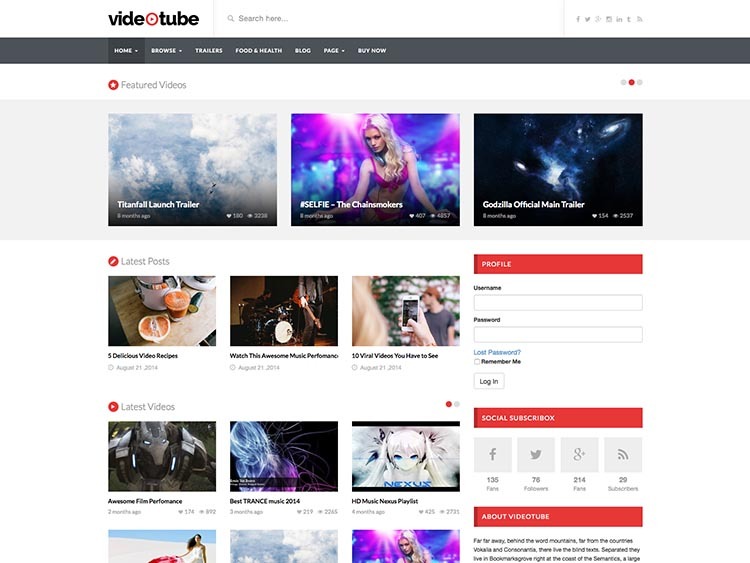 The developers of VideoTube have paid lots of attention to the little details, adding in features like built-in SEO, HTTP compression, custom logo support and lots more. It’s worth checking out the product page just to see the run down. 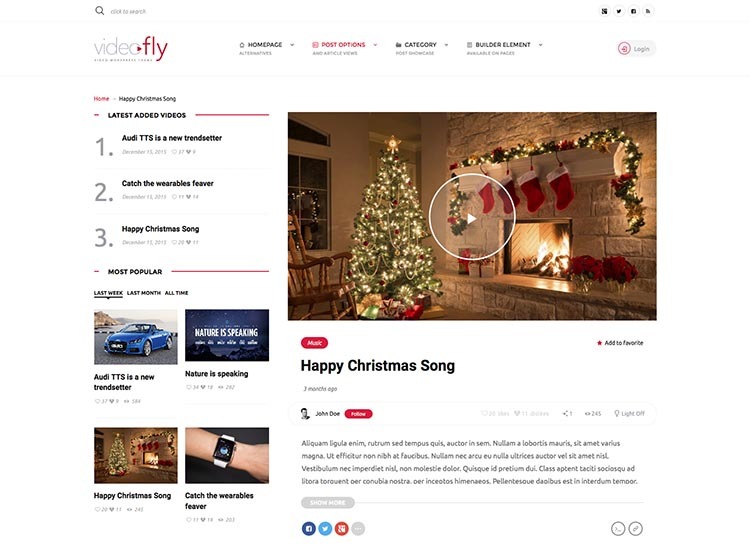 Packed with nine unique templates, and developed to be an all-in-one solution for vloggers and YouTubers, Videofly boasts a user-friendly, sleek and modern design. With layouts powered by Visual Composer and a comprehensive admin panel at your disposal, the customization potential is endless. The theme is fast, SEO friendly, and fully responsive–and it’s all built on Twitter’s robust Bootstrap framework. 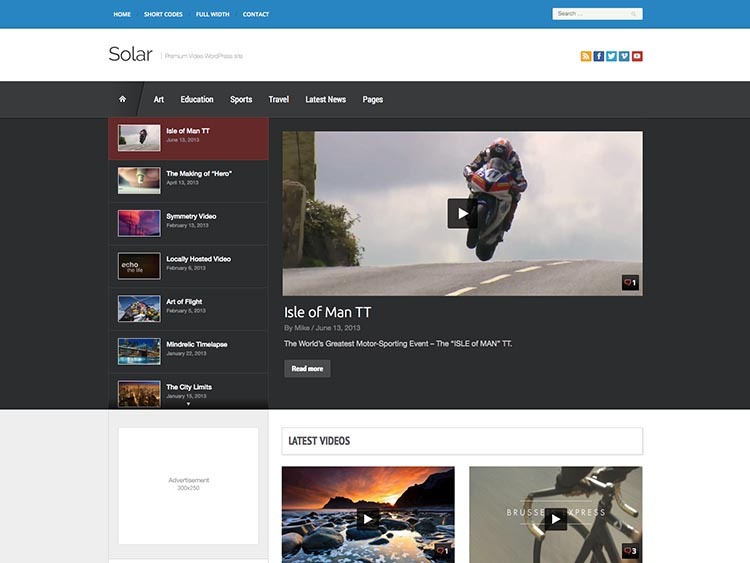 Solar isn’t one of the newest WordPress video themes out there, but an impressive design and decent selection of features make it a good option still. Both locally hosted video and embedded video are supported. Solar is retina ready, responsive, and supports unlimited color schemes thanks to a frontend color picker. Solar is easy to use, but the developer still provides excellent video (and written) documentation for beginners. A good choice for WordPress novices who might find themselves overwhelmed by a laundry list of features and options they won’t need. VideoCraft is another strong contender not to be overlooked. The developer notes that you can use this theme to (and we’re paraphrasing here) ‘create a website like YouTube’. Great, that’s presumably what you want to do! 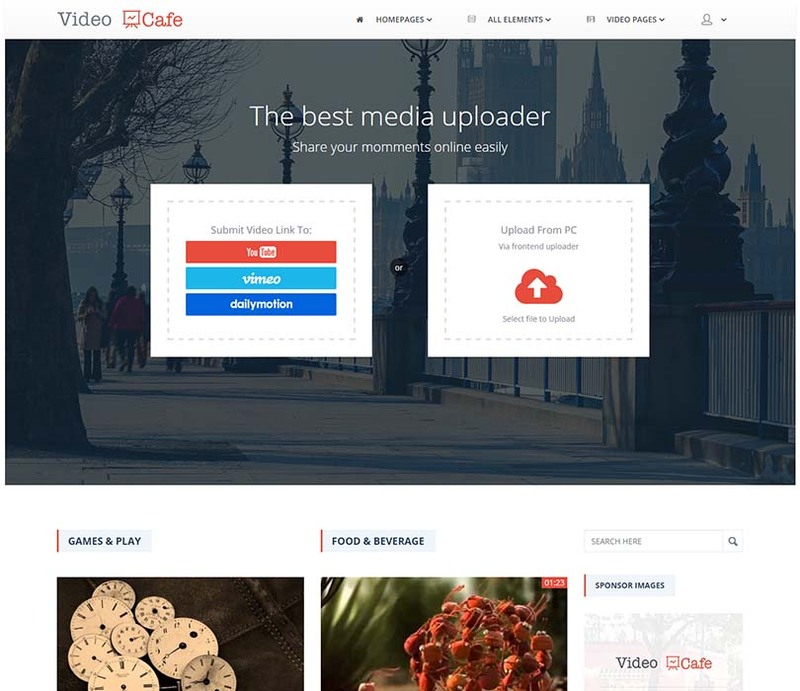 Users can upload their own videos, or link to third-party sites like metacafe and DailyMotion. Registration and login are quick & painless. 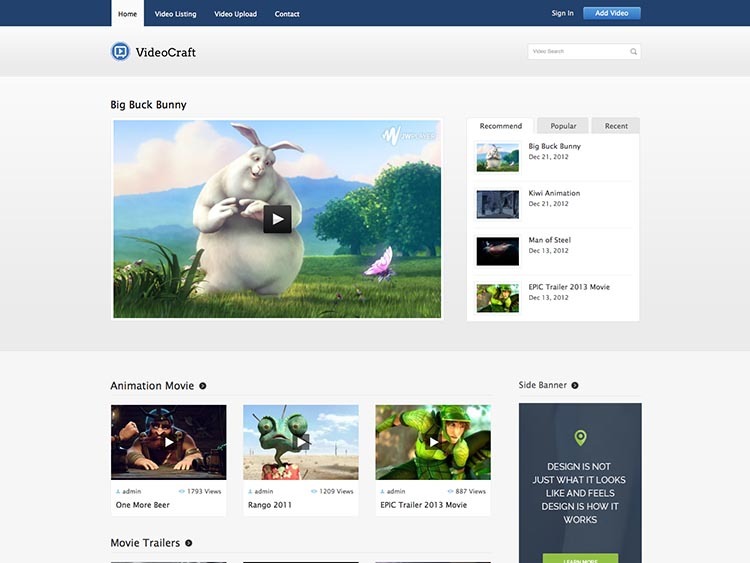 VideoCraft is responsive, so it’ll work great on any device, and a lot of nice extras like custom widgets and page templates are packaged in. VideoPress boasts a sleek, modern design. It’s simple to use, and users can upload their own videos. 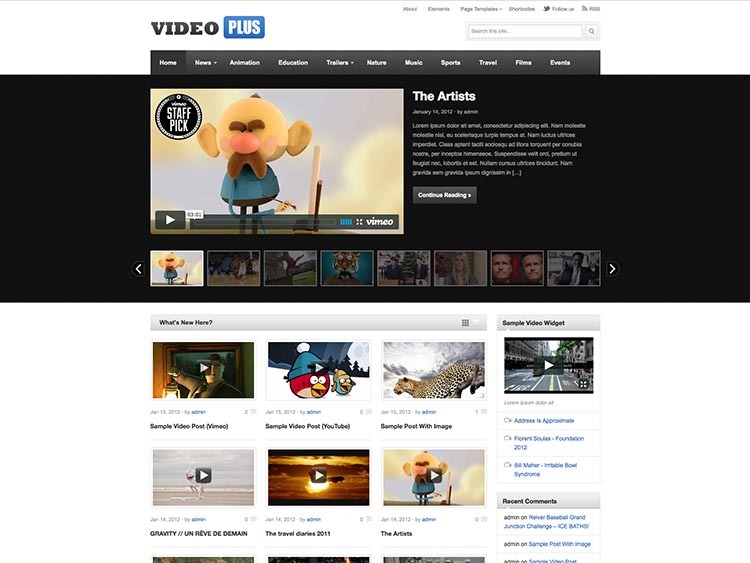 The theme additionally supports third-party video hosting. 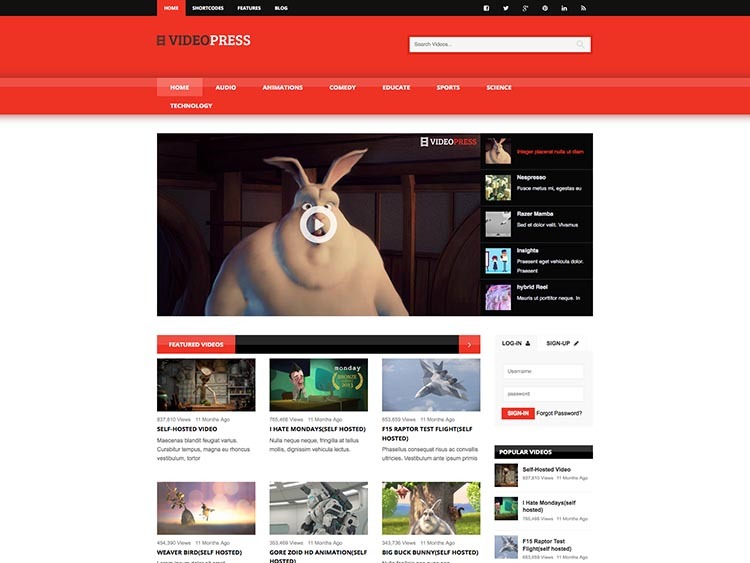 VideoPress comes with a handy layout builder, over 100 shortcodes, and a theme options panel for easy customization. VideoPro has a lot in common with VideoPlus, above, primarily because it was developed by the same folks (ThemeJunkie). A good option for creating a simple video sharing site, but not quite enough functionality to build a fully-featured independent video sharing website. This primarily supports embedded video from videos hosted elsewhere, and you’d need an additional plugin to support self-hosting videos. VideoPlus is a WordPress video theme that allows users to embed videos from popular third-party services like Vimeo and that other one. A third-party plugin (and possibly some additional styling) will be required to self-host videos. VideoPlus is search engine optimized, and comes with some useful features like advertising management (so you can make money!!!) and custom widgets. The theme is translation ready, and the developer provides lifetime support. VideoZoom comes to us courtesy of the popular premium theme developer WPZOOM, one of the best independent theme shops around. VideoZoom supports both embedding and self hosted videos. It’s built on top of the powerful ZOOM framework. Some of the features include custom post options, a video slider and multiple layouts. 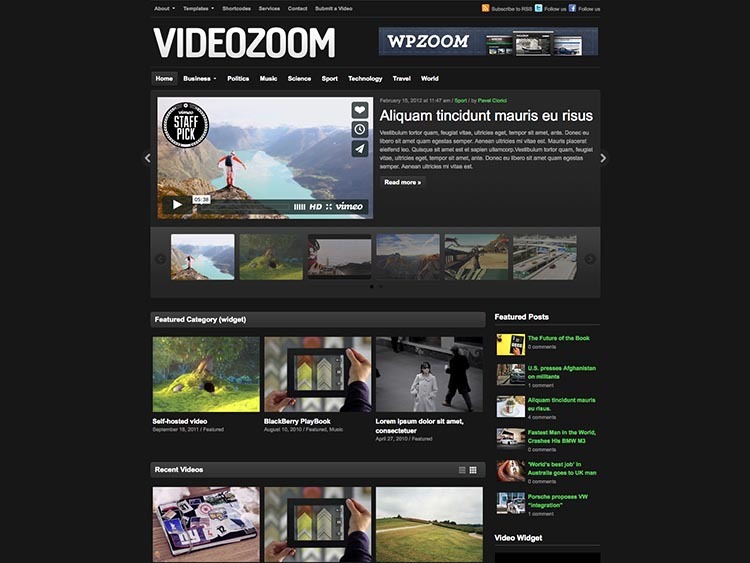 VideoZoom is responsive, and provides built-in SEO settings. Is it translation ready and easy to customize? You bet. Building a video sharing blog is easy with this top-notch template. This theme includes many different predesigned pages, trending videos, video playlists, and more. It also includes some great plugins, like the Elementor Builder, and more. And that’s it for our round-up of the best video sharing themes for WordPress (like YouTube). We’ll keep this updated as new themes are released. Feel free to leave your thoughts or whatever in the comments below. Be nice! Thanks, I loved this themes. http://www.codevirus.net –> Code Ransomware here.